Not so bad after all… – …STILL CRAZY AFTER ALL THESE YEARS! I know a lot of people love going to Taiwan and they praise the street food to the skies and of course, the bubble tea and dessert joints right here in our own country are always packed to the brim. Even in this little town, there are so many of them around – it has slowed down a bit by now but at one time, you would see them popping up all over like mushrooms after the rain. I am not sure whether those are franchises originating from that island republic or some enterprising local people jumping on the band wagon and setting up their own along those same lines to cash in on the craze. …at the mega mall where we had the gelato that day is one of them and obviously, it is doing pretty well as it has been around for many years now, probably two or three, at least – as long as the mall has been opened for business. I have never stepped into the place myself though and I am not even sure if it is one and the same or two separate entities. My girl went once and had the chicken chop from the stall on the left and she was not exactly thrilled by it so after that, she was not all that keen on dropping by there again. 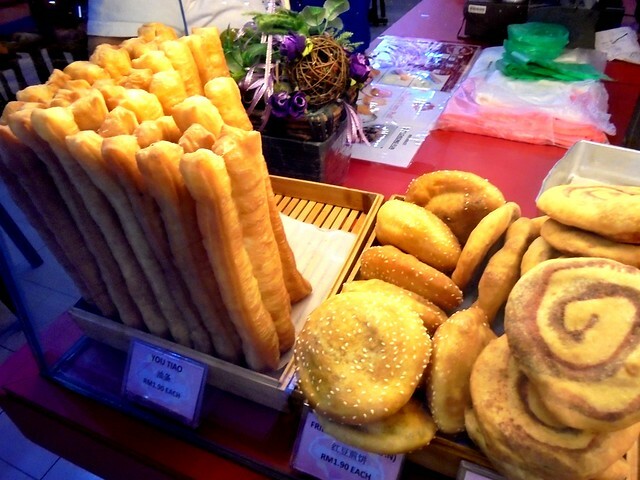 That afternoon, however, I insisted on taking a look at the fried stuff stall on the right – the “I Love Yoo!! !” to see what they had. 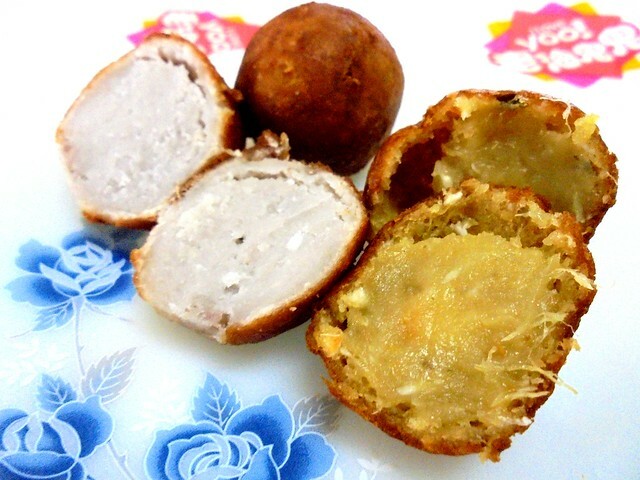 …and we decided to buy both flavours to try – sweet potato and yam. …and very little flour unlike the Malay counterpart and I must say they were very very nice – not cheap, 5 for over RM3.00…but nice! I certainly wouldn’t mind buying more of those to eat should I happen to drop by the mall again but then again, when the time comes, I may decide to try some of the other things they are selling there instead. I wonder if their curry puffs are any better than the others that I had had…and whether their butterfly bun is anything like our ma ngee or horse’s ears. I think I would want to check those out as well and maybe, some of the rest too. 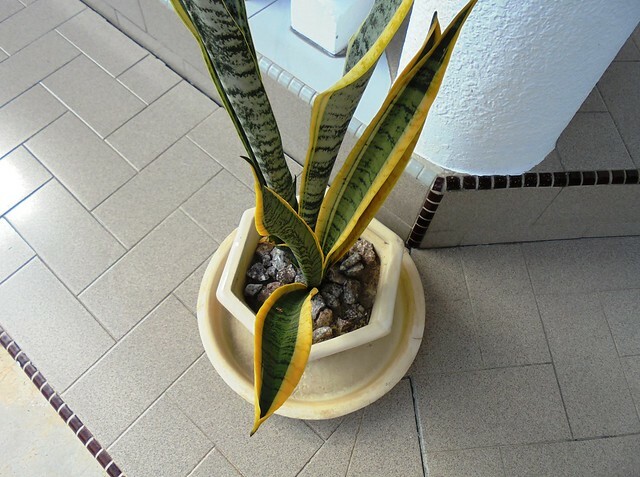 …is called – the mother-in-law’s tongue! That’s not very flattering, I would say and thankfully, my mother-in-law is very nice and not at all as sharp-tongued, not at all. Anyway, I saw my neighbour planting a few pots of this and I was wondering if he was doing that to keep away the many stray cats in our neighbourhood. They leave their fur, their paw marks, urine, claw scratches on our cars…and the worst thing is that ever so often, I would find headless bodies of rats or birds in my garden – they are deadly predators, those felines! I googled and found out that this plant is, in fact, poisonous to dogs and cats so if you have these in our house as pets, you should make sure you do not plant any of this or if you already have any, perhaps you should get rid of them or give them away. Anybody wants to give me theirs? Somebody just commented – unfortunately, I have no way of verifying the identity – no blog, no website, no Facebook account so I am afraid I am reluctant to let the comment go through moderation. Anyway, he said, “Cekodok is actually banana. Its [SIC] like deep fried banana bread, not sweet potatoes,” and indeed, when I googled, that is very true – I got all the banana balls. My apologies – that was what my friends over there told me those sweet potato balls were called – we did not have such things here so I did not have the slightest clue what the name was. I have already amended that in the above post nonetheless, even though this cooking blog has it down as “cekodok ubi”. Thank you, whoever you are, for the correction. grand sugar is the Taiwan eatery? I see the youtiao franchise outlet is in sibu too. I eat there before for the youtiao and soya milk only. I heard that if one drinks the drink made from that plant the person will lose the voice temporarily. You’re asking me? I wouldn’t know! All I know that both share the same premises, in the same shop lot – I do not even know if they’re one and the same. You have it over there too? Gee! Who would go and make drinks using the plant? We have youtiao franchise here but I have never seen Grand Sugar here before and I don’t think youtiao is a Taiwan eatery because I have not seen Ham Chim Peang in Taiwan. Thankfully, my MIL doesn’t. Phewwwww!!!! that sells Taiwan street food such as sticky gooey oysters very thin mee suah and super flat deep fried boneless chicken thigh meat amongst other food. Probably a local franchise then – doing very well too, outlets all over. You’d probably see a lot like this in Taiwan. Lol. The plant is as sharp as a MIL’s tongue!! My mum has a huge pot of this. Never try this Taiwan cafe before. Always passed by when went to the megamall. The big yue tiaw and fried snack did not tempt me enough. Lol. Yes, all these years we just walked past, finally gave it a try – no regrets. Not bad, nice balls. Will try some of their other things next time. Wow, I didn’t know mother-in-law’s tongues are poisonous to cats and dogs! Still, my dog has survived to the ripe old age of 14.5 without harm. He has generally left all our plants alone, though. Yes, those animals never bother those plants. I only know that dogs will look for some grass to eat when they are sick – there’s a wealth of medicinal stuff, a natural pharmacy out there! We can’t get any good ones at the stalls – none that is like what I used to enjoy when I was younger, eat with condensed milk or kaya. Dunno what got lost along the way – what we have now are simply not the same. Many Malay stalls frying and selling too, theirs even worse! Nice, yes…and they give curry gravy to go with theirs…but the texture, the taste everything…no, not the same. I wonder if the ones here are any better – will try one day. Never know that MIL tongues are poisionous to cats & dogs. I doubt whether the cats & dogs are afraid of it. 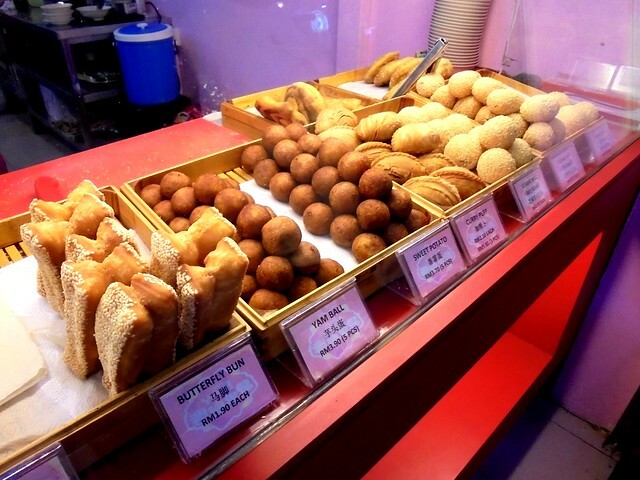 Love the curry puffs & sesame balls, looks like it. Not a fan of sesame balls – we have a lot of those everywhere…but I would want to try their curry puffs one day, see any good or not. I didn’t like the sweet potato balls as much as you did….actually yours do look a lot less starchy than the ones I had from the same franchise. For me, everything they sell, I can get better versions from any roadside stall, so I never returned. We can’t get any here, so that was a treat. Not that I would be going back so soon for more, not at those prices…but I would like to try some of the other things they have there. Arthur, I love the yam and the sweet potato too.. besides the “horse shoe” … so much sesame seeds.. best! You’ve tried? In Ipoh or in KL? I would want to try the horse shoe the next time I drop by this place. That’s always the problem with all these franchises, even the international ones – they’re not all the same. Like in Sg Petani, at the Central Square Pizza Hut outlet, the pizzas were ok but everything else was awful and the one at Village Mall was all right. Here too, the one in the town is ok but another one on the other side of town, quite far away, is way below par. I know that shop; used to be one of my favorite haunts before university. Not sure about the quality now, though. Oh? The outlet that you used to frequent would be a good one then? My girl is alss into all such deep-fried things. Yes, natural healing! They do that all the time when they are sick. All these frying balls make me drool as well. I love those with yam, sweet potatoes or pumpkin very much. I must check this outlet out when I happen to find one nearby. Ya, pumpkin would be nice too! Too bad they do not have that – we are more into sweet potatoes & pumpkin but the yam ones were nice too. They have I love yoo everywhere, it seems – just saw friend’s status on Facebook – they have it in Brunei too! Oh ya, those Taiwanese desserts are all over the place. there are two near my office but I have not tried. Ooo…I love ham ching peng! Loved it ever since I was a kid. And those balls do look good and surely taste good since very little flour is used. That plant, I have one too. It is still small and I think they look nicer when they are small.I don’t quite fancy the taller ones. 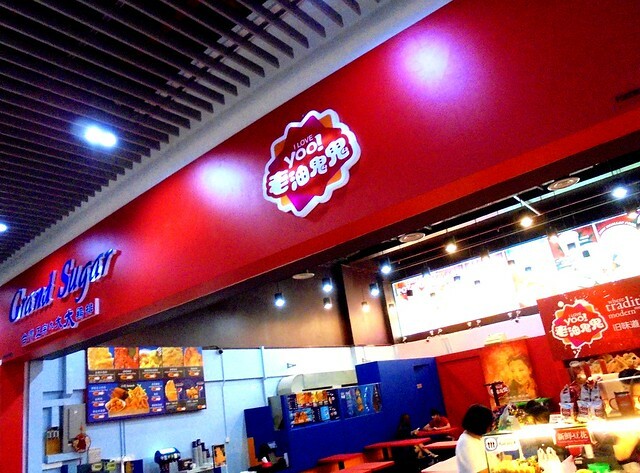 I never bothered about these Taiwan franchise places, first time…and was not disappointed. All these years, I just walked past. Will want to try some of the rest the next time I drop by that mall. Going to try the taufu fa and the cruller. Go see ENT specialist, don’t play-play. Eye sight is so important! Take care. Come, come! Always welcome. It is very very different here – very Chinese town but more Christian…quite unlike places in the mainland…you’ll love it, I’m sure. I wondered why they call it mother-in-law’s tongue ya? It’s sharp. Pray you do not get a MIL with a tongue like that. Now they have a branch in Sibu, good. I love their soya bean, and i will order yew char koi and go with it. Their porridge very smooth too. Butterfly bun, yes the KL version ma ngee. Ok, will surely try those the next time I drop by the mall. Pingback: For me… – …STILL CRAZY AFTER ALL THESE YEARS!